I hate to be trite and formulaic in my reviews with undeserved platitudes, but Mellisa Ameila truly is a precocious author, a talent who could develop into one of the leading voices of fiction. At 17 years old, she has more pure writing talent than most other authors with long, established careers. On the other hand, at 17 years old, she doesn't yet have the full life-experience upon which to draw, that reservoir of observations and development which will make her already prodigious talent even more compelling. Don't get me wrong. This book was a joy to read. If it seemed a little teenage girl-centric at times, a little weak on the depth of relationships, well, that is to be expected. And by choosing a 19-year-old woman as a protagonist, it makes sense. I just look forward to reading more of her work as she matures as she certainly has the writing chops to be a success. Ameila has one of the freshest voices in modern fiction to surface for quite some time. She is not a rote, plodding author, staying safe with standard writing styles. "Vibrant" is perhaps the word that first springs to mind in describing her style. As an American, that took me a bit of adjustment, to get the flow and rhythm of her very English narrative, but after getting past the mushy peas, knickers, and fags, I found myself adapting to her style. And it is that very unique style which makes the book itself unique, something other than run-of-the-mill. While her wordsmithing is the star of the book, the story is just as unique and off-the-wall. Khyle Exeter is a 19-year-old woman, someone on her own for quite a while and with deep-seated resentment of her mother. She returns to Blackleigh, a rather run-down city in Oxfordshire, and to put it bluntly, things get weird. She is stalked by Marcus, a powerful and threatening man, someone who Khyle feels hates her--and there is some truth to that--but who then seems to be protecting her. And she does need protecting. There are vampire-ish people (people?) who draw sustenance from the life-force of humans, wolves, harpies, a team of supernatural police-types, and a powerful entity which is ready to take over the world. 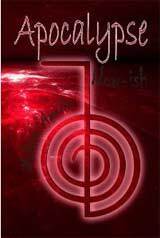 Khyle finds power within herself, learns things about her mother which changes her entire view on that relationship, and gets involved with trying to stop the threatened apocalypse. As I alluded above, the narrative does have a twinge of the young adult genre, but don't let that dissuade you. I am a middle-aged man who thinks the Twilight saga is mind-numbing. Yet, I was thoroughly engrossed with Amelia's work and look forward to reading more of anything she chooses to write. It is not often that a new author explodes on the scene, and Ameila deserves to have her work widely disseminated. I have the feeling that she will become a major player in the fiction market for many, many years to come.